Item. Their Majesties thanked Imigla Venture for her service as Baroness of Carolingia and, wishing that she continue to maintain herself in appropriate state, conferred upon her the lands of Ventura and the rights accompanying thereupon; whereupon the said Imigla retired from the Court. Item. Their Majesties thanked Fergus MacRae for his service as Baron of Carolingia; and, the protection of the Crown having thereby been removed, and the said Fergus having been indicted and convicted of wrongs against the Crown and the state, issued a Writ of Execution and Attainder against the said Fergus, the which document was created by Alys Mackyntoich and Vettorio Antonello. Whereupon, the said Fergus was taken to the market cross and his head was struck from his body. Item. Their Majesties heard the plea of Mistress Khioniya Ryseva for clemency on behalf of the pinas des Indes hailing from the lands of Western Seas; and having weighed her words, Her Majesty rescinded her edict banishing and attaindering the pinas des Indes, vulgarly known as pineapples, saving those that appear upon the archery field. Item. Their Majesties invested Colin Ursell as Baron of Carolingia, the which deed was confirmed in a document created by Alexsei Dmitriev. Item. Their Majesties invested Nicolette Bonhomme as Baroness of Carolingia, the which deed was confirmed in a document created by Altani Khatagidai. Item. 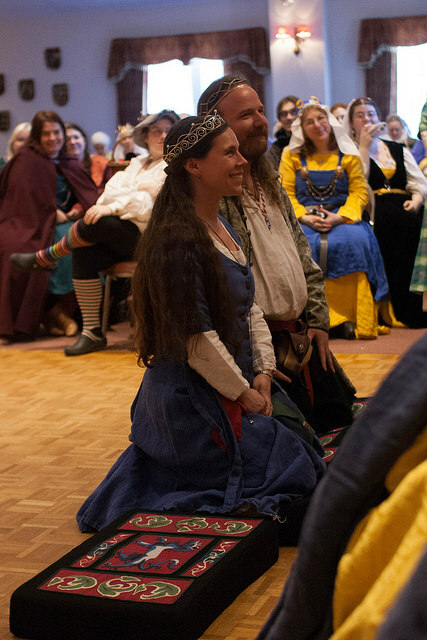 Their Majesties accepted the fealty of Colin and Nicolette as Baron and Baroness of Carolingia. Whereupon the Court was adjourned until later in the afternoon. Item. Their Majesties caused Joiha Huguenin to be brought before them and, so doing, awarded her Arms, the which deed was confirmed in a document created by Lada Monguligin. Item. Their Majesties awarded Arms unto Gudrun Thorvaldsdottir, the which deed was confirmed in a document created by Aaradyn Ghyoot. Item. Their Majesties summoned the good Aine Oliphant before the Court, whereupon they awarded her Arms, the which deed was memorialized in a document created by Svea the Short Sighted. Item. Their Majesties caused David of Quintavia to be brought before the Tyger Thrones and thereupon awarded him arms, the which deed was confirmed in a document created by Nest verch Tangwystl. Item. His Majesty endowed Yehuda ben Moshe with the King’s Award of Esteem for his work on the heraldic staff for the reign. Item. Their Majesties summoned Raziya bint Rusa before the Court and, praising her good works in the study of plants and herbs, invested the said Raziya with the Order of the Maunche, the which deed was memorialized in a document authored by Aildreda de Tamwurthe, calligraphed by Eleanor Catlyng and illuminated by Sakurai no Kesame. Item. Their Majesties commanded the attendance of Sigmarr Avarsson and, so doing, awarded the said Sigmarr Arms, the which deed was confirmed in document created by Constance de Saint Densi and Lillian atte Valeye. Item. 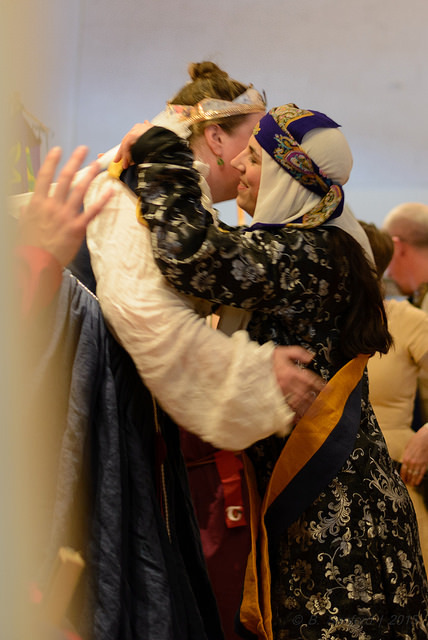 Their Majesties caused Ammalina Taikkizhavi to be brought before the Court and, so doing, awarded Arms unto the said Ammalina, the which deed was confirmed in a document created by Nest verch Tangwistel and Agatha Wanderer. Item. 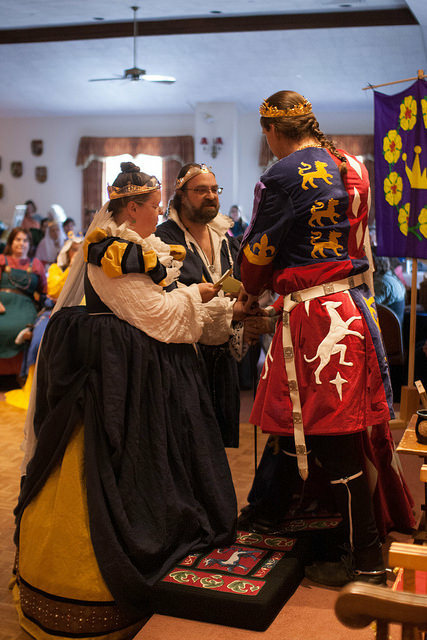 Their Majesties endowed Cassandra Boell von Bayer with the Order of the Burdened Tyger for her labors in creating the feast for Their Majesties’ Coronation. Item. Her Majesty endowed Li Kung Lo with her Queen’s Award of Esteem. Item. Their Majesties created Ygraine of Kellswood an Artisan to the Crown for her many talents and labors. Item. Their Majesties gave tokens to the Baron and Baroness of Dragonship Haven for them to distribute to the populace, as emblems and signacles of Royal gratitude for their work in arranging that group’s Baronial Investiture. Item. Their Majesties commanded Cristoff Gockerhan von Loch to attend upon them, whereupon, praising his diverse travails for the good of the Kingdom, inducted and invested him with the Order of the Silver Crescent, the which deed was confirmed in a document created by Constance de Saint Denis and Æsa feilinn Jóssursdóttir. Item. Their Majesties created their noble servant Sergei Rozvad syn a Court Baron and Granted him Arms, the which deed was confirmed in a document created by Nest verch Tangwistel. Item. 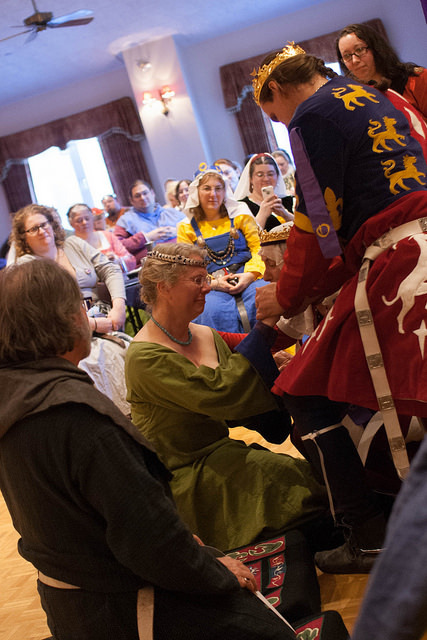 Their Majesties created the good lady Æsa feilinn Jóssursdóttir a Court Baroness and Granted her Arms, the which deed was memorialized in a document created by Nest verch Tangwistel. Item. The House of Lochleven presented their tithe of taxes to the Baron and Baroness of Carolingia. Item. 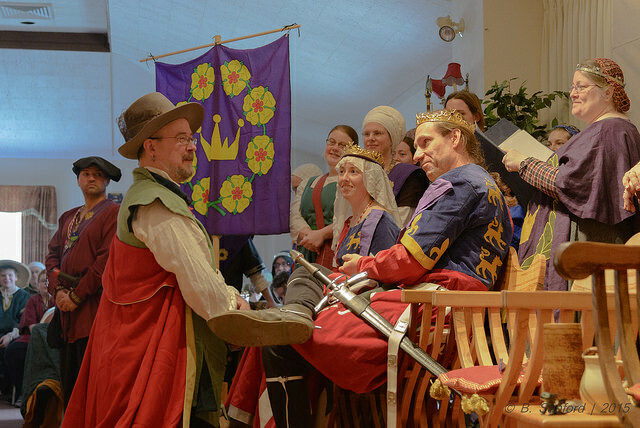 Their Majesties called into the Court the good Liadin ingen Chineada and awarded her Arms, the which deed was confirmed in a document created by Jonathan Blaecstan and Melisande of Griffin Wood. Item. Their Majesties awarded Arms to the good and worthy Aimee of Carolingia, the which deed was memorialized in a document created by Nest verch Tangwistel and Lisabetta Medaglia. Item. Her Majesty endowed Simona bat Leone with a token of gratitude by virtue of her good works for Their Majesties’ benefit. Item. Her Majesty endowed Anton of Winteroak with her token in absentia. Item. Their Majesties created Alec Craig an Artisan to the Crown. Item. Her Majesty invested Dereca ni Donndubhain with the Queen’s Award of Esteem for her good works in support of the Realm. Item. Their Majesties created the following ladies Seamstresses to the Crown: Dereca ni Donndubhain, Edyth of Steyning, Matilda of Carolingia, Rosina von Schaffhausen and Constance de Saint Denis. Item. His Majesty endowed Constance de Saint Denis with the King’s Cypher for her diverse labors in support of the reign. Item. His Majesty endowed Clarice della Luna with his King’s Cypher for her good works in support of the Crown. Item. 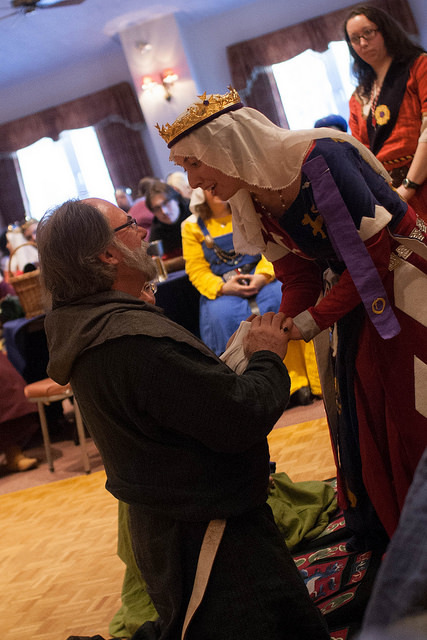 Her Majesty invested Lachlan Graheme with the Queen’s Order of Courtesy, the which deed was confirmed in a document created by Sorcha Dhocair ingen ui Ruairc and Ulrich Reinhart. Item. His Majesty invested Lucien de Pontivi with the King’s Cypher for his notable and honorable works. Item. 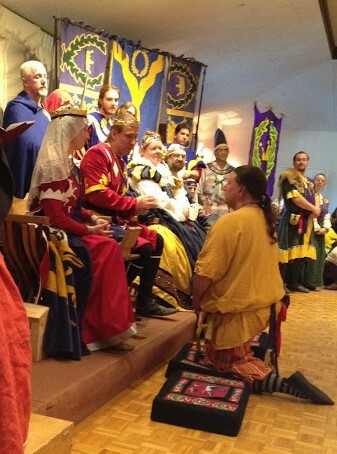 Her Majesty invested Aildreda de Tamwurthe with the Queen’s Cypher for her true and worthy service. Item. 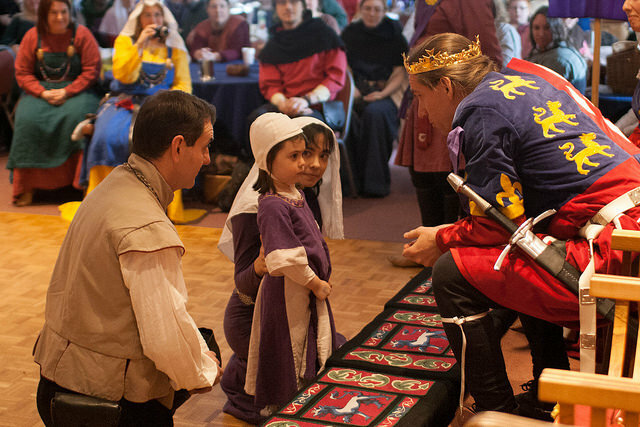 His Majesty invested Anastasia da Monte with the King’s Cypher for her labors as part of the heraldic staff and the Queen’s Guard. Item. Her Majesty summoned Michael of York to attend upon her and, praising the good Michael’s unfailing noble bearing and undoubled honor, invested the same Michael with the Queen’s Order of Courtesy, the which deed as confirmed in a document created by Bronwyn of Wentworth. 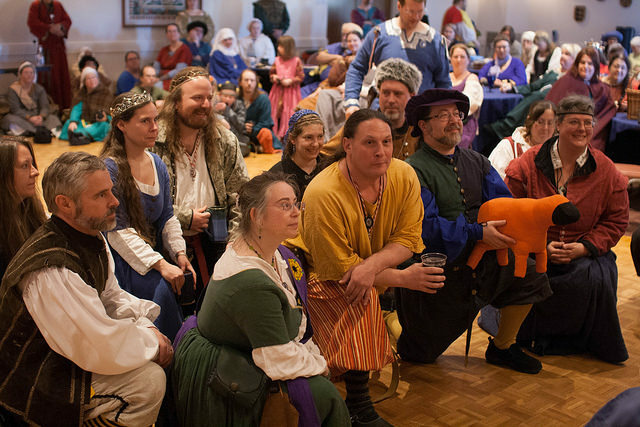 whereupon they lauded the good Catrin’s diverse and sundry good works over many years, not least of which being the creation of the East Kingdom Gazette, thereupon created the said lady a Baroness of the Court and further endowed her with an Augmentation of Arms, the which deed being confirmed in a document created by Aildreda de Tamwurthe and Eva Woderose.